How do I set up my own file number system? Learn how to set up your own file number system in just minutes! Only users with Admin roles may set up a file number system. Follow the simple instructions outlined in this article and you can get started with your own custom file number system today! Please Note: If you see a blue button that says Opt-in gapless system when you reach your Company Settings page, that means you are still using a previous File Number System build. If you would like to update this feature to the newest version, simply click the button (pictured below), and ensure that there is a checkmark next to Enable FileNumber system. Begin by clicking on your initials in the top right corner, then selecting Account from the drop-down menu. From here, select the Company Settings tab from the top of the Account page to be redirected to the File Number System set-up. The next step is to make sure that you have checked off the blue box next to Enable FileNumber system (as pictured below), and this will ensure that your number system will activate once it is saved. 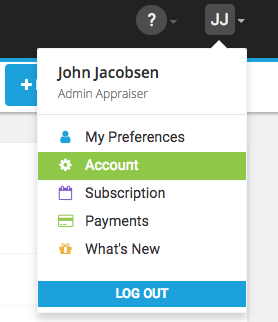 - Increment file numbers to automatically set each time you add a new appraisal order. Type whatever you want in the Build Your File Number box. You can also add values that automatically update. - Next Number: This is the next file number you'll be using (just the number) on your next appraisal order. 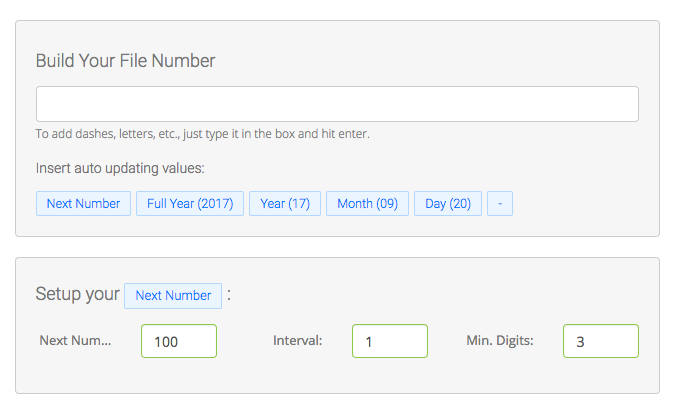 To use this, in the Next Number Field input the next file number you'll be using (just the number) on your next appraisal order. - Interval: The amount the file number will increase each time you create a new appraisal (the most common is 1). - Date Value: These values will automatically update based on the numerical value of the current date. The possible values include Full Year, Year, Month and Day. A preview is also provided so you can see what your file number set-up will look like based on the criteria you have entered into the build. You can always come back and edit your file number system to match up with any changes you may make. Once you are happy with the format of your file number system and the way the preview looks, all you have to do is save your work and you're done! You can also leave it blank if you choose to not use this feature.